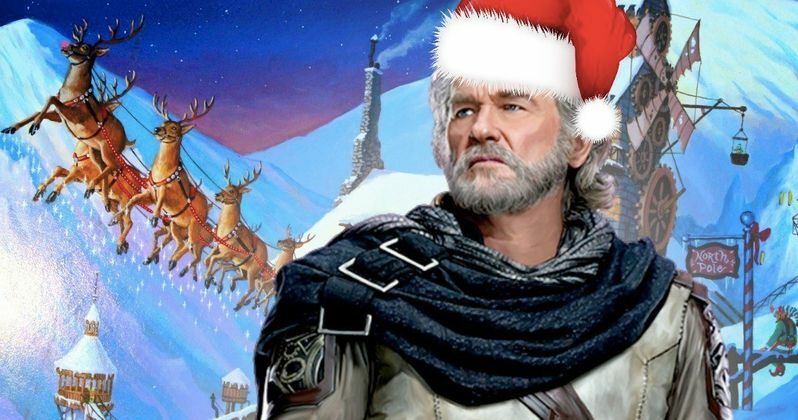 Kurt Russell has signed on to play Santa Claus in an The Christmas Chronicles, joining young actors Judah Lewis and Darby Camp. Production is now scheduled to begin in January 2018, with Netflix eyeing to air this holiday movie around Christmas 2018, although no specific release date has been issued thus far. There is no indication about how many more cast members still need to be added before filming begins. The story centers on a pair of siblings, played by Judah Lewis and Darby Camp, who try to get proof that Santa Claus is actually real, by catching jolly Saint Nick on camera. When they accidentally cause Santa to crash his sleigh in Chicago, they join up with Saint Nick to help get Christmas back on track before it's too late. The script was written by Matt Lieberman, who wrote The Addams Family stop-motion project that is in production for MGM. The script, which was once entitled 12/24, was based on an original idea by Lieberman and Designated Survivor creator David Guggenheim. Clay Kaytis (The Angry Birds Movie) is directing this new Christmas Movie, with Chris Columbus producing alongside his 1492 Pictures partners Michael Barnathan and Mark Radcliffe. Executive producing will be Ocean Blue Entertainment, Monica Lago Kaytis, Lyn Lucibello, Adam Kolbrenner, Robyn Meisinger and Guggenheim. It was also confirmed that Oscar winning visual effects artist Erik-Jan De Boer (Life of Pi), will be responsible for overseeing the visual effects. It was confirmed that this project will be a live-action/CGI-animated hybrid movie. This is quite the departure from Kurt Russell's two massive movies that hit theaters earlier this year, The Fate of the Furious, where he plays Mr. Nobody alongside Vin Diesel and Dwayne Johnson, and Guardians of the Galaxy Vol. 2, where he plays Ego the Living Planet, the father of Star-Lord (Chris Pratt). The actor doesn't have any other future projects in the works, although there is talk that he could return in Fast & Furious 9, but that has yet to be confirmed. The actor is certainly well-known for playing hardened characters in the past, so it will be interesting to see him portray Santa Claus. Kurt Russell's new co-star, Judah Lewis, made his feature film debut back in 2015 in Demolition, starring alongside Jake Gyllenhaal, before starring in Game of Silence and in the new Netflix movie The Babysitter, alongside Bella Thorne. He has a new movie entitled Summer of '84 in post-production, which will premiere at the Sundance Film Festival next month. Darby Camp is coming off her role as Chloe Mackenzie, the daughter of Reese Witherspoon's Madeline Martha Mackenzie, in HBO's Big Little Lies. She has also appeared in episodes of Grey's Anatomy and The Leftovers, and she's currently filming Dreamland with Margot Robbie and Travis Fimmel. The Hollywood Reporter first broke the news on this Christmas movie earlier today.